Disclaimer: The views expressed by the respected journalists on this page concerning skiing in Poland and snowboarding in Poland do not necessarily reflect Sunshine World Holidays LTD's own views. Sunshine World does not endorse any of the statements on this webpage as accurate at the time of reading (as some of the articles on this page were written a few years ago). 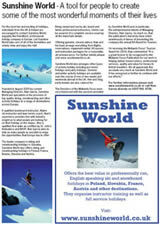 ... Snowboard Club UK (SCUK) Review Sunshine World Holidays in Poland! 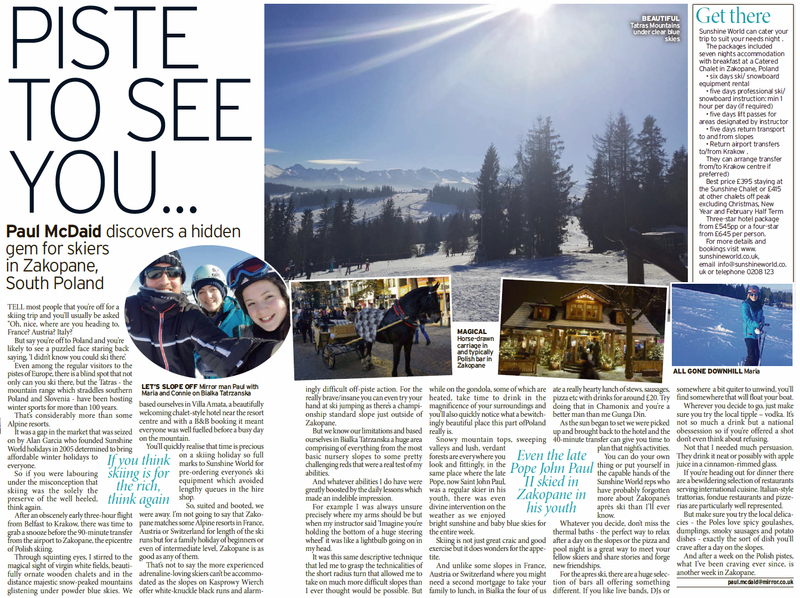 Adrian Bridge heads into the Polish Tatras and enjoys a skiing holiday offering great value – and a few fresh challenges. It is not often that you get to ski on slopes that have received a papal blessing, but that is one of the pluses of a winter holiday with a difference in the Polish resort of Zakopane. The late Pope John Paul II hailed from these parts and during his years at the helm of the Catholic church in Kraków, he liked to retreat to the nearby Tatras and have a quick schuss with the best of them. Slightly bizarrely during what turned out to be the most memorable of the three days I spent in Zakopane last February, I ended up teaming up briefly with a British man of Polish ancestry whose brother had actually skied with Karol Józef Wojtyla, as the pontiff-to-be was then known. "What happens now?" I asked. "Now we take a romantic sleigh ride together," replied Alan Garcia. I'd been in Zakopane for less than two hours and already I was a little nonplussed. I'd fully expected Poland's top ski resort to be a little less modern than its Alpine counterparts. What I hadn't expected was for my journey to the slopes to be Dobbin-powered. As the driver whispered sweet nothings into his horse's ear, I wondered whether this trip to test Poland's premier pistes had been such a bright idea after all. I needn't have worried. The sleigh that Alan – managing director of an operation called Sunshine World, a specialist in ski packages in Zakopane – had commandeered was an optional throwback targeted squarely at tourists. Visitors can get around more swiftly on public transport or by taxi, and they'll need to: pretty as Zakopane is, with street after street lined with wooden chalets, it's far too big to walk around. A new contender is vying to be Europe’s best-value ski resort – the Polish mountain town of Zakopane in the Tatra Alps, with an incredible 51 ski areas on its doorstep. Prices are as low as they go - £10 for a ski pass, £1 for a beer and a tenner buys a gourmet dinner with wine. Yet the standards are much higher than other eastern bloc ski countries like Bulgaria and Romania. No hand-me-down rickety old chairlifts from Austria, but the best, state-of-the-art Doppelmayr quad lifts wit rolling mats. For sure, most of the region’s skiing is mamma and pappa-style resorts like you find in the Eastern United States, with two or three short runs. But there are bigger areas, and when these are linked up they will give some of Austria’s linked ski areas a run for their money. Zakopane has its own beginner/intermediate slope, Szyloschkowa, in the town, and an even larger mountain, Bialka, served by four chair lifts. Best of all, just outside the town, is the Pope’s mountain – 2000 metre-high Kasprowy-Wierch. This was Pope John Paul’s favourite ski mountain and he loved to take on its challenging runs every time he visited his birthplace nearby. Kasprowy has some serious blacks and reds and couliour skiing at the summit and a five mile home run back to base. This area will keep a good skier busy for few days sport. Really good skiers will struggle to get real challenges but for those who don’t need to ski endless pistes, and are happy with the same little mountain, Zakopane is ideal. And it’s perfect for first timers. Poland was the first eastern bloc country to throw off the shackles of communism, although there is still plenty of mediocrity. However its standards are well up on other eastern European countries, particularly in bars, restaurants and hotels. It’s the prices that appeal, Food and drinks are a third of prices in Britain. I stayed in a four-start luxury hotel for £80 a night bed and breakfast and dined like a king in the Hotel Belvedere (best in town) for £20 a head, including a bottle of Chilean Shiraz. Zakopane is brought to the British market by Surry based tour operator Alan Garcia who toured the world looking for the ideal resort to start his Sunshine World operation. He was particularly under whelmed with his native France for its chauvinistic attitude towards visitors, particularly the profit bringing Brits, but chose Poland because they welcome us with open arms. Zakopane is a two-hour BA flight from Gatwick to ancient Krakow (return prices from around £100), then a further two hours on winding country roads. Krakow itself is well worth a visit and is starting to rival Prague for cultural tourism and stag and hen nights. We stayed there in an apartment in a former imperial palace for the princely sum of £9 per head, including breakfast. "Alan Garcia, managing director of Sunshine World, whether he realises it or not, is a bit of a lefty too. In 2005 he set up his company to bring high-quality skiing at rock bottom prices ..."
Snowboard Club UK (SCUK) Review Sunshine World Holidays in Poland! The time has come…winter is here... time to get all your kit out and try it all on, maybe even strap your board on in your lounge (we’ve all done it, haven’t we?!) and start dreaming of your immanent escape to the mountains. The problem is that given that the euro and pound are pretty much one for one the usual destinations seem a little out of reach this year. Time to broaden your horizons and try somewhere new. Ever thought of Poland?... neither had I! Succumbing to the reality that a trip to the French Alps was highly unlikely this year I began to consider other alternatives. Until setting up Sunshine World as a discount partner with Snowboard Club UK Poland had never been on my radar, but with prices in the French Alps going through the roof and the fact your après ski beer will cost you less than £2 Poland definitely seemed worth a shot! Sunshine World offer all inclusive 7 night packages customised to your specifications from just £375 per person, and with return flights costing as little as £60 return a week’s holiday will cost you a credit card friendly £435! With a flight to Krakow of just over 2 hours and the same again for the Sunshine World transfer we were in Zakopane in just over 4 hours. Despite its size Zakopane is a quaint, romantic town placed at the heart of the Tatra Mountains in the far south of Poland. It was a surprisingly large resort, probably the largest I’ve been to in fact, but still managed to have the alpine atmosphere of a smaller French resort. We were there in mid January but it still had all the charm and ambiance of the Christmas holidays, complete with Santa and his reindeer! The main stretch of town had a varied choice of restaurants, ranging from Pizza Hut and the Golden Arches (McDonalds) to quaint traditional polish restaurants complete with traditional 4 polish bands. Most menus have an English translation, although it’s not always the best idea to know you’re eating “grandma’s homemade lard”, just one of the traditional Polish dishes! The food is good hearty mountain food, although it consists mostly of meat there is still a selection of vegetarian dishes on most menus. Dinner costs an average of £20 for a two course meal, including drinks, for two people. If you not too full and fancy a night out there’s some good bars that stay open till around midnight and a few clubs that go till about 3/4am. Sunshine World offers accommodation ranging from luxury 3* hotels, picturesque chalets to basic hostels. Our chalet was in a charming and quiet area approximately 20 minutes from the main stretch of town and although you can walk it a taxi will only cost around £2.50. The chalet was picturesque and as far as we could see the light switches, door handles and windows were the only things not crafted from wood. There was a small communal area with access to a computer and free internet (wifi is available in all the rooms at no extra cost) but not really anywhere to relax. However, the rooms were warm, cosy and clean and considering you are either out on the mountain during the day or at a restaurant in the evening this really didn’t prove to a problem at all. The owner of the Chalet was friendly and more than happy to answer any questions we had. Breakfast (which is included) was a traditional breakfast of cold meats, bread, cheese, yogurt, cereals and tea and coffee and available from 9-10.30. The Sunshine World team picks you up every morning at 10am (the time can be arranged to suit you) and takes you to one of the skiing areas around Zakopane. Bania and Kotelnica, Bialka Tatrzanska, which is about a 40 minute drive from Zakopane was our first stop. I was half expecting to see dated, perilous lifts but instead found that the lifts were the same standard as any you’ll find in the more developed resorts in Europe. There are 5 chair lifts, 3 drag lifts and a few t-bars which accommodate all levels of rider, from beginner to intermediate. Although queues for the main lifts at the bottom were reasonable during the week they did get much busier over the weekend. There was a new Burton park being built whilst we were there, which was pretty small but still looked fun. There are a few bars and a canteen style restaurant as well as a highly recommended 3* hotel restaurant which serves traditional hearty, warming meals and cost on average £15-20 for food and drink for two. Bania is the largest ski area after the big mountain, Kasprowy Wierch, which was unfortunately closed whilst we there. Kasprowy is a national park so it won’t open unless there is 2 metres of snow. We also went to Szymoszkowa, which was a super small hill with only 2 chair lifts, a perfect opportunity to take advantage of the professional coaching Sunshine World offer. Having never had any professional lessons I was keen to get some coaching with one of the instructors. James, who was a level 3 CASI instructor, was an excellent, patient and passionate teacher who genuinely enjoyed seeing me improve on my technique throughout the day. Even if you don’t feel you need any lessons I would highly recommend taking advantage of this opportunity. The whole Sunshine World team are young, enthusiastic and friendly and genuinely enjoy each other’s company. This made for a relaxed environment which felt more like riding with a group of mates than with ski reps. All the staff are professionally qualified, English speaking and very competent. The instructors have a true passion for their chosen sport which comes across in their individual teaching style. The staff at Sunshine World go out of their way to make it as hassle free as they can for you. I would recommend Poland and Sunshine World to anyone looking for a friendly, comfortable and cheap holiday. The slopes do get a little repetitive after a few hours but all in all I’d say that it’s great value for money and perfect for beginner to intermediate levels. Of course we didn’t get to see the big mountain, which we’re told is far more challenging for the more experienced rider. If the stories of the big mountain were true I would not hesitate in going back. On top of the already dirt cheap prices Sunshine World offer SCUK members a further 10% discount! View SCUK discount offer here. With a WSG team just returning from a snowbound fact finding mission to Zakopane Poland, there seams no end to the huge snowfalls hitting Eastern Euope. The team reported much powder off the pistes, that’s if you didn’t mind a bit of a walk along a sphincter clenching ridge next to a cornice. And with a further 21cm forecast for the upper slopes, over the next three days, 12cm of which is due to fall Friday, now’s a good time get your arse on a flight to Krakow. The WSG team stayed with www.sunshineworld.co.uk who will sort out transfers, hotel and a tour of the local night spots. Do the exorbitant prices of the well-known resorts make your credit card freeze? Read on for a wonderfully cheap alternative. The beautiful town of Zakopane, set into the Tatra Mountains in the far south of the country, is renowned throughout Eastern Euope as being a gorgeous place to ski and snowboard. And it's a popular summer destination, too. In Britain though, perplexed faces told me people couldn't fathom why my son and I were travelling to Poland for winter sports. It wasn't surprising, considering that until now there have been no UK holiday companies operating from this resort. Please note that the article below was written in 2006 and some of the facts may have changed now. Being served a burger by a waitress in hotpants and a tiny Hooters vest top was not exactly how I'd envisioned my first meal in Poland. I get chatting to one of the waitresses and find out that she earns about £20 a week. No wonder holidays in Poland are so inexpensive. A three-course dinner with wine costs under a tenner. It's cheap, but is it any good? Zakopane is the winter capital of Poland in the Tatry Mountains, part of the Carpathian range which runs through Slovakia and Romania. The highest peak served by lifts, Kasprowy Wierch, rises to 1,987m. 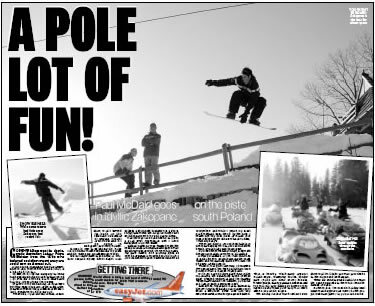 Zakopane has hosted three FIS World Ski Championships and numerous Ski Jump World Cups – so far, so credible. Skiing in Zakopane is spread out over a series of small satellite hills, which have a handful of lifts on them at most. Kasprowy remains the most serious skiing to be had, with even a few red and black runs and some decent off piste. 'It looks like the back bowls of Vail,' says my partner of the eastern face. We arc down, knee-high in barely-touched powder, and play slalom with trees lower down the mountain. We grin ear-to-ear as we stumble across powder stashes, several days after the last proper dusting. Because Kasprowy is on a nature reserve, only taxis and horse-drawn sleighs are allowed to transport people to and from the base of the mountain at Kuznice. We decide to take the traditional option, and barter with a whiskered old driver to take us to our hotel for 30 zlotys (about £5). Tucked up in blankets, we take in the romance of forests and timber chalets. You don't have to be skiing all week on Kasprowy, though, so it's as well that some of the other options – Gubalowka, Nosal and Bialka, are surprisingly good, old-fashioned fun. Hit that tree trunk rail, jump that fence, race to the base. A liftie waves his fists at us but it seems a mad waste not to mark the powder off the side of the gently-sloping slopes. For a more high-octane hit, we zip around the undulating terrain on snowmobiles. The snow twinkles, the engine roars beneath us, and we scare ourselves cornering wildly. In resort the adventure continues at restaurants with all the cultural bells and whistles you could want – regional costume, Goral (mountain man) music, and succulent grilled sausages or pierogi (stuffed dumplings.) I enjoy grilled oscypek (a smoked sheep's cheese textured like halloumi) with berry compote. At the swish four-star Hotel Belvedere there's a spa, swimming pools and a couple of classy restaurants if you fancy something lighter. Or if you're after something a bit more lively, Prestige disco has Eurotrash written all over it, there's even a pole in the middle of the dancefloor to swing yourself around if you've had one too many Zywiec (beer). Christine travelled with Sunshine World (www.sunshineworld.co.uk) which offers all-inclusive packages to suit various budgets. Getting there: Fly from the UK to Krakow with BA (www.ba.com) from £40 one way, easyJet (www.easyjet.com) from £14.99 one way, or BMI Baby (www.bmibaby.com) from £21.99. The road transfer to Zakopane takes two hours. 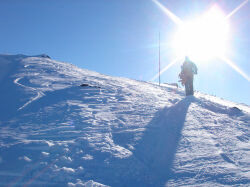 High-end: Sunshine World (www.sunshineworld.co.uk) is the only UK tour op offering skiing.